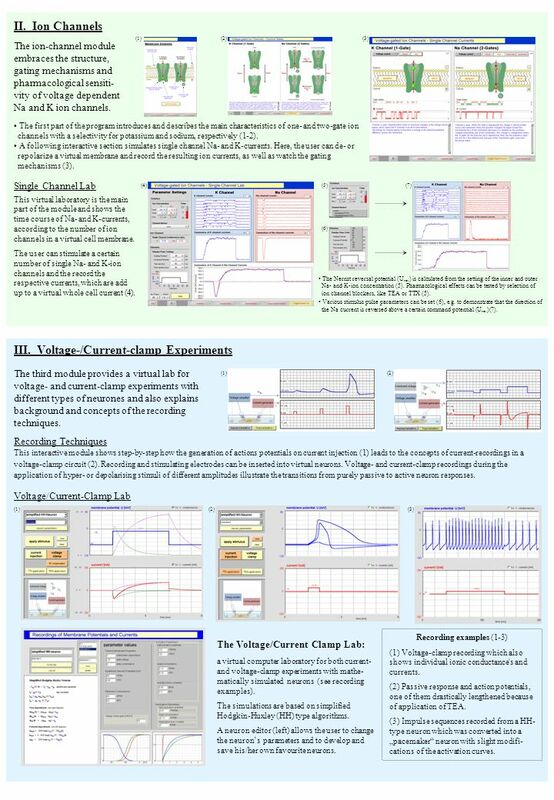 Voltage- and Patch-Clamp Experiments in Virtual Computer Laboratories (cLABs-Neuron). Hans A. Braun; Horst Schneider; Bastian Wollweber; Heiko B. Braun. 2 II. Ion Channels The ion-channel module embraces the structure, gating mechanisms and pharmacological sensiti- vity of voltage dependent Na and K ion channels. The first part of the program introduces and describes the main characteristics of one- and two-gate ion channels with a selectivity for potassium and sodium, respectively (1-2). A following interactive section simulates single channel Na- and K-currents. Here, the user can de- or repolarize a virtual membrane and record the resulting ion currents, as well as watch the gating mechanisms (3). (1)(2)(3) Single Channel Lab This virtual laboratory is the main part of the module and shows the time course of Na- and K-currents, according to the number of ion channels in a virtual cell membrane. The user can stimulate a certain number of single Na- and K-ion channels and the record the respective currents, which are add up to a virtual whole cell current (4). (4)(5) (6) The Nernst reversal potential (U rev ) is calculated from the setting of the inner and outer Na- and K-ion concentration (5). Pharmacological effects can be tested by selection of ion channel blockers, like TEA or TTX (5). Various stimulus pulse parameters can be set (6), e.g. to demonstrate that the direction of the Na current is reversed above a certain command potential (U rev )(7). (7) III. Voltage-/Current-clamp Experiments The third module provides a virtual lab for voltage- and current-clamp experiments with different types of neurones and also explains background and concepts of the recording techniques. (1) Recording Techniques (2) This interactive module shows step-by-step how the generation of actions potentials on current injection (1) leads to the concepts of current-recordings in a voltage-clamp circuit (2). Recording and stimulating electrodes can be inserted into virtual neurons. Voltage- and current-clamp recordings during the application of hyper- or depolarising stimuli of different amplitudes illustrate the transitions from purely passive to active neuron responses. Voltage/Current-Clamp Lab (2)(1)(3) The Voltage/Current Clamp Lab: a virtual computer laboratory for both current- and voltage-clamp experiments with mathe- matically simulated neurons (see recording examples). The simulations are based on simplified Hodgkin-Huxley (HH) type algorithms. A neuron editor (left) allows the user to change the neurons parameters and to develop and save his/her own favourite neurons. Recording examples (1-3) (1) Voltage-clamp recording which also shows individual ionic conductance's and currents. (2) Passive response and action potentials, one of them drastically lengthened because of application of TEA. (3) Impulse sequences recorded from a HH- type neuron which was converted into a pacemaker neuron with slight modifi- cations of the activation curves. 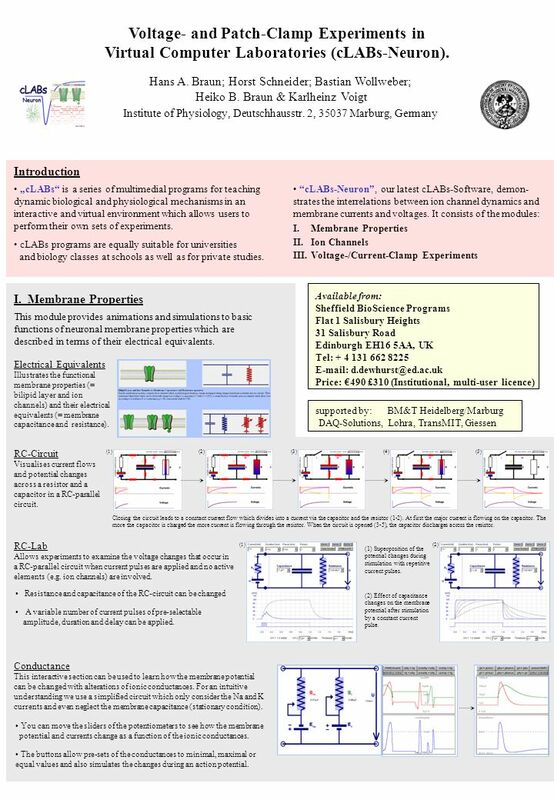 Download ppt "Voltage- and Patch-Clamp Experiments in Virtual Computer Laboratories (cLABs-Neuron). Hans A. Braun; Horst Schneider; Bastian Wollweber; Heiko B. Braun." BME 6938 Neurodynamics Instructor: Dr Sachin S. Talathi. Bioelectromagnetism Exercise #2 – Answers TAMPERE UNIVERSITY OF TECHNOLOGY Ragnar Granit Institute. Modeling the Action Potential in a Squid Giant Axon And how this relates to the beating of your heart. A brief introduction to neuronal dynamics Gemma Huguet Universitat Politècnica de Catalunya In Collaboration with David Terman Mathematical Bioscience. This PowerPoint shows circuit diagrams superimposed on the membrane in order to illustrate current flow in three of the tutorials: The Membrane Tutorial. DC circuits Physics Department, New York City College of Technology. Basic Electronics. Need to know Definition of basic electrical paramater A set of rules for elementary circuit analysis The means of current flow in circuits. Electric Circuits Voltage Measurement. Current Measurement.